Living in Vegas is much like walking through Times Square–bright lights, strange sights, international feel and appeal. Thankfully, I don’t live on Las Vegas Blvd, but a trip to the strip is always a spectacle, much like walking into the Star Wars bar scene, or the Wynn Hotel on Tuesday night. I grabbed a friend, headed to the strip, uploaded periscope, and began walking and talking while he filmed. Although our hot spot signal jammed and we didn’t capture the encore performance– which included a passerby hotel guest (Republican visiting from Louisiana) getting into it with 3 Berners who were talking about “stealing from the rich to help the poor”, we did manage to capture quite a few great moments from people willing to share their fair share… of opinions. What happens in Vegas, doesn’t always stay in Vegas. Just ask the red shirts: the 200 union members of National Nurses United who came from all over the country to support a socialist– but who aren’t socialists. However, my interview was cut short by their leader as she did not approve of my questioning and they needed to get back to chanting. By the way, I didn’t find any Webb, Chaffee or OMalley supports….are there any? But you can meet the rest of the Berners and Everyday Americans for Hillary here and listen to my debate recap in any of the national and regional radio shows here. Although a nuclear Iran Climate Change is the greatest threat to mankind, I will try and get some much needed rest. I have to work in the morning to pay for all the free stuff. You have a very ignorant view of social programs, probably to fool your readers from learning the truth. 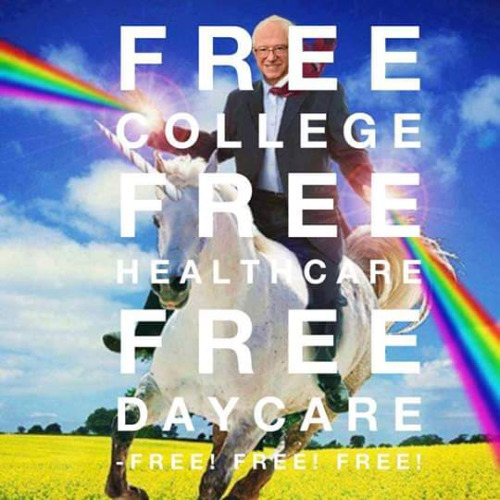 Free healthcare, college, daycare? No, nothing is free. It is taxes that pay for it just like all thr socialist programs americans all take for granted like streets, highways, police and fire protection, public schools, ss, medicare, military (republicans love that one) etc. If you love st. Ronnie so much, let’s take things back to the eighties when income distribution was much more fair. Why is redistribution of wealth such a bad idea? Well, we have been redistributing wealth for over 40 yrs, upward. Let’s go back to the Reagan days, ehat do you say???? ?